One of the things I was looking forward to most about my daughter starting preschool was the opportunity for ME to meet new friends. I was really hoping to find a really cool group of women who have the same kinds of values with different backgrounds, and that we would all hit it off amazingly well and have coffee together and talk about the trials of Mommyhood. And guess what… it happened! I have met the neatest people at this preschool. I really like them, and I really like their children. Now, when I say that it happened, I mean the first part happened. But it’s just amazing how, no matter how hard we try, we just can’t seem to find the time to get together for a cup of coffee, or sometimes even for a 5 minute chat after drop off. So when there was a flier in my daughter’s cubby for a Tuesday morning group called Moms Supporting Moms, I was all over it. We’ve started reading a book by Lysa TerKeurst called “The Best Yes,” which is about learning to say no, and learning to say yes to the best option for you and your family. The other day, our conversation turned to the fact that many times, we all just feel overwhelmed. The other ladies in the group and I are all in different situations: a mom who works full-time, a mom with a child in grade school and a preschooler, me, the mom with a two-year-old and a four-year-old. I said to the other ladies that sometimes I feel ridiculous saying that I feel overwhelmed. I stay at home with my girls, who are still little, so we don’t have a million activities to do or practices to attend. We have family and friends that are close by who are always willing to help out. And yet, especially for the last couple of weeks, at the end of every day I sit down and realize that I didn’t get half of the things done that I wanted to, and yet, I can’t really put my finger on one thing that we did do. 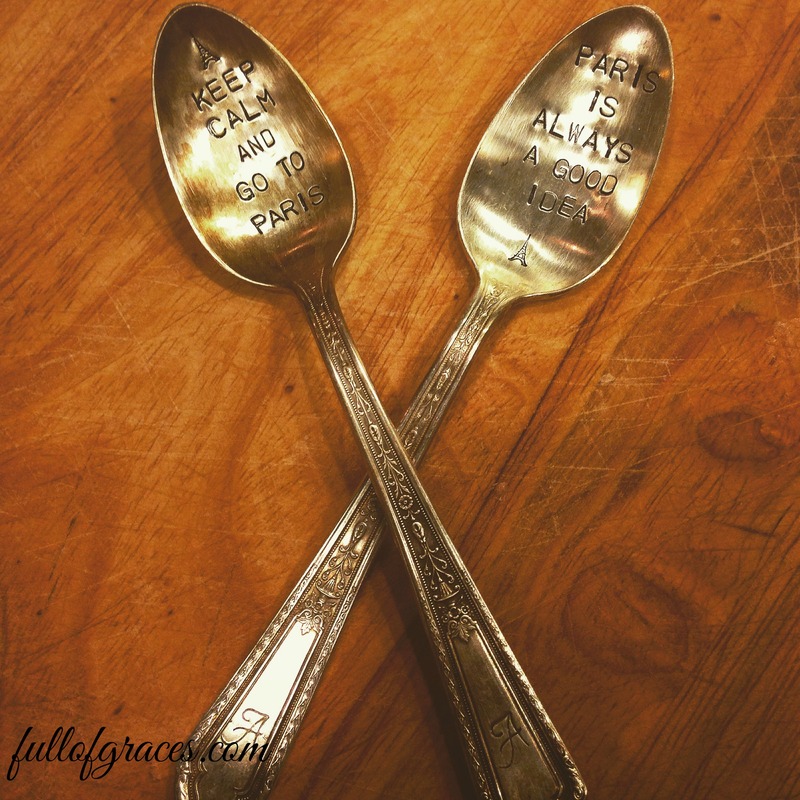 One of my new friends in the group, Becky, said that she read an analogy recently in which a woman said to imagine at the beginning of the day, you have a handful of spoons, like a handful from the cafeteria line. And every task that you need to do takes a spoon. Make breakfast? There’s a spoon. Get yourself and the kids dressed? Another spoon. Grocery shopping? Spoon. But where it gets tricky is when extra things pop up that take an extra spoon. Breakfast takes one of your spoons, but what about when the two-year-old keeps playing with her cereal milk, even after you’ve told her not to, and just when you get up to get another cup of coffee, the bowl ends up on the floor? That takes up one of your spoons. A tantrum at the grocery store? That takes up two spoons, on top of your already allotted grocery spoon. Sometimes at the end of the day, you reach in your pocket for another spoon and there are no spoons. Let me tell you, lately, I’m out of spoons by, like, dinner. Violet is shaking off her nap, which means that she needs to nap, but has realized that Mazie and I do stuff while she sleeps, and she’s missing out. So by about 4:30 on days that she doesn’t sleep, she is losing her mind. And Mazie is at the age where she super wants to help with everything: mopping, washing the dishes, making homemade bread, cleaning the toilets, folding the clothes. It’s really sweet, but those of you who have a four-year-old know that when they “help” it isn’t really help, and the task itself then takes minimum twice as long. Throw in teaching SAT tutoring classes, blogging, hosting essential oils classes, and a ton of other things that I want to do, and I’m all out of spoons. There was a day last week that I woke up and reached for my spoons for the day, only to find that my stash had not been replenished. Perfect. Unfortunately, I don’t really have the answer at the end of this blog post. But I will say that it helps to talk about it; it helps to know that it isn’t just me who is drowning out there in Mommyhood. There just might not be an “answer.” In “The Best Yes,” TerKeurst writes that we often fly the flags of things that we have overcome in our past, but that we rarely talk about the shortcomings that we are struggling with in our present. So here I am. I’m waving the white flag of the Overwhelmed Mama, hoping that you will see it and take solace that you aren’t alone. I asked Grandma Betty once how she survived being a single mom of two little kids who were only 15 months apart and she looked at me and said, “Some days I didn’t.” While that seems a little bleak, it was also very comforting. It means that I’m not some horrible failure as a mother, as a woman, or as a person. It means that we all go through valleys where the struggle is real. It also means, though, that we will come out on the other side having survived after all. Thank you for being honest, Dana! My mom reminded me recently that the days are long, but the hours are short to accomplish everything we want/need to do. Wishing for more spoons for you!